SYNOPSIS OF ARTICLE: In 1968, when I was a young assistant professor in the Department of Psychiatry at Stanford University some 40 years ago, I was deeply troubled and moved by the assassinations of John F. Kennedy and Martin Luther King. I wanted to explore, to know the roots of violent behavior in humans, and I wanted to study the path to its prevention. As a result I was inspired to form the “Committee on Violence” with other young faculty and residents. Two of us even had an article, “Violence and the Struggle to Adapt,” published in America’s leading scientific journal, “Science” in 1969. I was also invited to join the President’s “Task Force on Violence.” We reached out into the community in many ways. Together we even published a highly received book, Violence and the Struggle for Existence, as we discovered that the deepest root of violence in humans is in our struggle to adapt having gone awry. This paper below shares the root causes of violence and the consequent path to its reduction and prevention. A Paper Published in “Nine Points,” November, 2001. A Book Published by Little Brown and Company, May, 1970. Why are we such a seemingly violent species? What makes us resort to behaviors ranging from homicide to genocide? What functions does violence serve? How has it been an adaptive behavior? What can we do to reduce violence, even end it? Here I provide a synopsis of our conclusions, including key recommendations that today, appear truer than ever. In all behaviors, there are universal, generic aspects common to all Enneagram types. Sometimes those of us in the Enneagram community start considering everything as type-related. It is these universal aspects that I mainly address here. As with all of the primate species over our long evolutionary history, threats of violence and violence itself have functioned in four ways in order to further survival and adaptation. They have served to: (1) provide safety and security for the group, (2) protect the young, (3) assure resources and defend territory, and (4) maintain social structure and a dominance hierarchy. Thus, the circumstances of violence as a coping behavior take place: (1) when these important functions are endangered or dashed, (2) when a present and/or personal orientation prevail (that is when the future seems to disappear and no help seems available), (3) when few or no alternatives are experienced, and (4) as a planned means to a goal. All of these can conspire together, intensifying the likelihood of violence, ranging from individual acts to collective destructive acts. Just reflect on these for yourself! These four functions and associated four circumstances are often compounded by the strong tendency for us humans to dehumanize the object of the violent action, to almost completely identify ourselves with our position, and to disown our own shadow side of aggression and ill will. This is what attribution theory is all about, where each group (or individual) believes that “our violent behavior is a result of the circumstances and necessary because the other group’s (individual’s) violent behavior is a result of their character.” Since both sides are doing negative attributions simultaneously, an escalating circle of destructive behavior often results. Each side feels both justified and victimized by the other side’s bad behavior. This makes for what has been called the “malignant social process,” where whatever we believe increases the enemy’s welfare, decreases ours. All of this depends on our point of view, just like type itself is a point of view that is seen thanks to a set of perceptual filters. In addition, all of this had some limits during most of our evolution. Rapid evolution of the cerebral cortex outstripped changes in the “lower” brain centers, culture outstripped biological keeping pace, and now technology outstrips even cultural change. And while we have a great capacity for consciousness, all these evolutionary changes outstrip our current consciousness. Before the horseshoe was invented, you could only travel a few miles a day. Conquest was very difficult. Furthermore, we can’t count on defense, as human fallibility limits our ability to respond and heightens the hazards of collective violence. Here are some examples. There are limits of rational thinking, of risk-management technology, of memory and attention, of planning and practice, of mental alertness, of functional stress responses, of capacity for vigilance, of command-and-control functions, of psychological processes in political decision-making, and on and on. Lastly, we must remember that collective violence, e.g., war, usually explodes the peace it promises to bring. And those replacing violent oppressors usually assume the oppressors’ violent practices. Collective violence does not produce the result it purports. Instead, it often brings destruction, further dehumanization and despair. Moreover, war has no special providence: everything accomplished through violence has also been accomplished through peaceful means. So what can we do about this? First, we need to keep building an awareness that collective violence is , at the root, a survival strategy turned maladaptive and anachronistic. Violence would not have been thus rooted in our behavior if it originally had no survival value. Awareness, real consciousness of ourselves, and the understanding of others that comes from this, are key as perhaps it always has been. But now, awareness is a necessity, not something that gets relegated to the good-idea category. The events of and since September 11, 2001 bring this home to us. We can no longer polarize the world of human kind into “us” and “them” as once was possible, even adaptive. Those of us in the Enneagram community have a start. We work on understanding others and ourselves and on integrating our psychological and spiritual lives. We know that we all have habits of attention, a system of perceptual filters that govern our minds, hearts, and bodies, and we believe they serve us and our survival. We try to learn how these habits are outmoded and anachronistic. We work at conscious change and conduct. We practice presence and the opening of our hearts. What we need to do is apply this path more globally. This epic work by psychiatry residents and junior faculty in the Department of Psychiatry and Behavioral Sciences at Stanford University detailed the fundamental theories of violence from biological to social, the range of current issues of violence from gun control to mental illness, and the increasing maladaptive roots of violence. These issues still remain today perhaps in even more poignant expression. 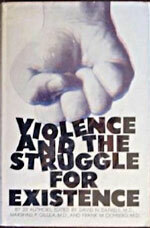 See Daniels, D. et al: Violence and the Struggle for Existence, Boston, Little Brown and Company, 1970 and Gilula, M. & Daniels, D. “Violence and Man’s Struggle to Adapt”: Science, 164:396, 1969.